I haven't update in a bit. 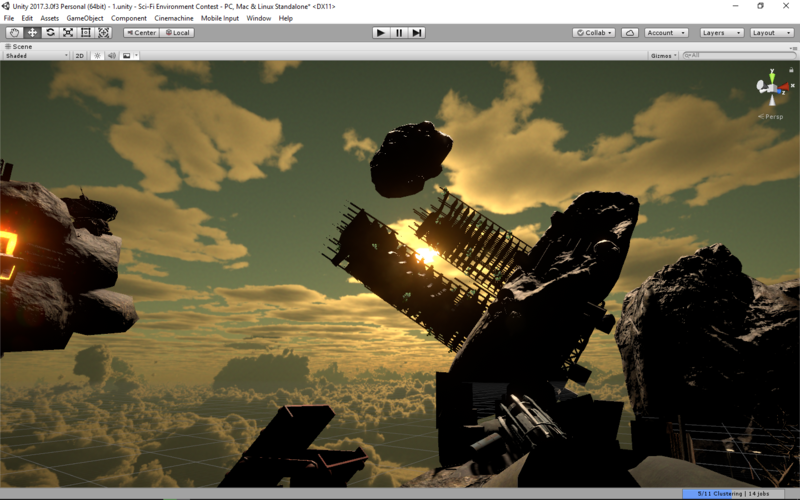 I've been trying to get Unity Recorder to work with my scene and it was an utter failure. I don't think my rig can handle the capture process (I ended up using OBS, which is great but also couldn't pump the appropriate frame-rate). So my final video ended up pretty grainy with dropped frames. I did get to make use of one of the instrumental tracks I composed for another project though! :D Not much I can do about it right now, so I'll cover a bit of the work I've done in the meantime. The entire video is controlled by a master timeline that picks the camera and animates its dolly position. The title and fade were made using the UI tools with the alpha controlled by the master timeline as well. I also added a few more assets to fill out the final scene. I also grabbed this hologram shader by andydbc on GitHub. It's pretty great! Most everything has had the textures swapped or modified, and I used pieces from many of the models for other objects in the scene. I also made extensive use of the Post-Processing Stack V2, which I'm absolutely in love with. The lens masks for the bloom are especially lovely! Thanks to all the people who provide free assets on the asset store! I couldn't get by without you. So, I needed a bunch of ropes and nets to connect all these floaty bits. Blender is my tool of choice for this. I made several different ropes of varying tautness by using an array modifier and curve modifier to extrude out a low-resolution cylinder. This allowed me to UV map a balanced portion of the rope and then duplicate that mapping along its length. I also made several wrapper objects I'll demonstrate later (I'm using these with a net material to create on demand nets of various shapes). I also made some dangle cloth objects to decorate the ropes (won't add them until the next detail pass). These were relatively straightforward objects. Deformed planes with even UVs. The first objects I wanted to dress up were BG items since the fidelity didn't matter very much at that range. The first shot in this update was a progress shot on that work. It really works with the overall ramshackle tone that's getting established. Now I have to start thinking about the final video. I'd like for much of the floating stuff to be shifting around, and to have the connecting ropes reacting appropriately. This would really establish the whole floating part of the sky desert. This would also be a nightmare to animate for every object in the scene. I now have to pick discrete areas to showcase in this way. After I got my foreground and background references in place, it was a lot easier to "sculpt" out ideas and find answers to some of the questions posed earlier. I like the idea of scavenging from the modern (henceforth, old) world. I also prefabbed out a few of the things I had already constructed (the catwalk, most notably) and started sketching out the next navigable area. At this point I hit a wall with my free asset needs. I need ropes and nets, and different configurations of each (from singles that are straight and drooping, to bundles and "wraps" that I can reuse around multiple objects. Things are constantly floating and falling. Rigid structures make less sense and lots of things need to be strapped up/down/wherever. So I started by grabbing this texture and making it seamless in GIMP (just the default filter, nothing fancy). I'll fix lighting, etc. on the original texture as I go, I just want to get it in the scene as quickly as possible. Next I'll be modeling a whole bunch of ropes and wrappers! First off I need to get the mood just right. The desert means a lot of different things to me at different times, but I tend to associate it with contemplative "airy"-ness. So I throw a playlist together targeting that vibe; mostly spacious, ambient tracks and somber instrumental guitar. Normally I'll throw together a mood board with images from artists and films, snippets from poems, and excerpts of anything I want to inform the overall vibe. In this case I have a pretty solid idea of the baseline aesthetic so I'll get to work quickly (and messily) building a close-up chunk of the level and a background chunk that we can hopefully snowball off of later. I've decided that the first little playable island should be a junk sorting area. The sky yields very little usable resources, so people living there are probably going to be scavengers. In the above picture you can see all the gross seams between the disparate assets I used to 'plug' up the rock. I'll get around to fixing those in more detail later. I also added a few box colliders to handle player collision on top of the island. Whether or not I'll need them depends on the game ultimately, so in this case they're really there so I can walk around through the level for fun. A practice I recommend regardless of how the asset gets used, ultimately. I forgot to mention that I'm set to linear colorspace. I also went through all my assets that used legacy shaders and set them up with standard shaders. I also tinted several things to bring them closer to the same pallete. At this point in the process I threw in a default character controller to make sure the scale was right and I also did a rough set-up of the global Post Processing volume to make everything look a little nicer. Ambient Occlusion and a tiny amount of bloom with help a lot with coherence between disparate assets. When certain materials looked too pristine to be found in a desert wasteland I would just throw on a secondary albedo from one of the grimier assets. This helped me rough up some of the less usable models and was surprisingly effective. I'll cover this process in detail in my next post. I also hacked together a background object to reference. Some kind of factory island or smelter (I'm just calling it the factory for now). It's got some quick and nice particle systems that I'll also cover in the next post. Since I lack both concept art skills and a Concept Artist I tend to start the conceptualization process by picking a visual theme and building up from there. I'm obsessed with floating islands and I've been missing the desert a whole lot lately, so let's mash those together for my concept. What does a desert in the sky look like? How do the denizens get by there and what conditions do they have to deal with? Why are they there in the first place? And, of course, I grabbed Cinemachine and version 2 of the Post-Processing Stack, which are both pre-reqs for my projects anymore. So, now I've got a bunch of objects waiting in my assets folder with nothing to do at the moment. Next up I'll start setting the mood and building my REFERENCES! My name is Trey Coe and I'll be rocketing into the Neon Challenge low on time, resources, and energy. Being the case, I made it a point to use only free or self-produced assets and to extend their use with some quick and easy bashing techniques. I also decided to constrain the free assets to ones available in the asset store, and to only produce assets that cannot otherwise be approximated. I do not specialize in level design but must interface with it frequently (gotta love that solo dev life) and hope to showcase, for less experienced environment artists and other similarly inclined solo developers, how you can squeeze a surprising amount of juice from a small kit. Next up I'll be breaking down the conceptualization process!